Fresno State's Kevin Bell made a leaping pass after stealing the ball from Hawaii's Julian Sensley in the final seconds of the first half last night. FRESNO, Calif. » Coming off its first road win of the season, the Hawaii basketball team hoped to transform into true road warriors last night. Instead, the Rainbow Warriors looked just plain road weary. Unable to match Fresno State's quickness and energy at critical moments, UH dropped a 73-67 decision to its longtime Western Athletic Conference rival before an announced crowd of 10,233 at the Save Mart Center. After trailing by as many as 14 points in the second half, the Rainbows got to within 71-67 on Matt Lojeski's 3-pointer with 1 minute, 14 seconds remaining. But that's as close as UH would get. Lojeski and Julian Sensley both missed 3-pointers in the final minute before Quinton Hosley iced the game for the Bulldogs by hitting consecutive free throws with 14 seconds left. Hosley finished with a game-high 25 points. Lojeski scored 20 for UH (13-9, 7-5 WAC), and Sensley added 16, ending a string of three consecutive 20-point efforts. "We worked our butts off to get back in the game, but we couldn't fight all the way back," Lojeski said. "We didn't make our run early enough, and when we did, we didn't have enough left to finish it." 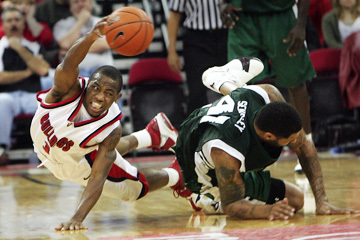 UH dropped to 1-7 on the mainland after defeating Boise State 73-64 on Saturday for its first road win of the season. With the 6-foot-9 Sensley lining up next to 6-9 Matthew Gipson and the 6-7 Ahmet Gueye, the Rainbows had the size advantage over a Fresno State front line that featured no starter taller than 6-8. The Bulldogs (13-10, 6-6) overcame the height discrepancy with repeated penetrations and by grabbing most of the loose balls. Both teams pulled down 34 rebounds. "Their penetration definitely hurt us," Lojeski said. Fresno State's energy was never more evident than in the final 2:06 of the first half, when the Bulldogs reeled off eight straight points to take a momentum-building 38-30 lead. Dwight O'Neil, who did not play in the Jan. 21 game at the Stan Sheriff Center due to academic reasons, capped the rally by soaring for a dunk with 1 second left after teammate Kevin Bell stole the ball at midcourt. UH coach Riley Wallace argued that time had expired before O'Neil jammed the ball through the hoop, but there were no courtside TV monitors to help Wallace make his case. "I thought we came out ready to play, but getting two starters (Lojeski and Gipson) into early foul trouble really hurt us," Wallace said. "They went to the bench, and the rest of our starters got tired." Sensley and Gueye each played 40 minutes, and starting guard Deonte Tatum played 36. Gueye finished with nine points, eight rebounds and five blocked shots, helping UH eclipse the school's single-season blocks record of 128 set during the 1993-94 campaign. "I don't think we played that bad," said Lojeski, who finished 8-for-12 from the floor. "That last 2 minutes in the first half just killed us." The Rainbows played most of the first half in man-to-man defense before switching to a matchup zone in the second. Fresno State, which hoisted a WAC-record 37 3-pointers in the previous meeting, finished 8-for-25 from beyond the arc. UH, seventh in the WAC in 3-point accuracy, went just 1-for-12. Hosley led all scorers with 14 first-half points on 6-for-10 shooting. Ja'Vance Coleman added 13. "Their outside shooting and our inability to shoot from outside ended up costing us," Lojeski said. Sensley got off to a slow start in the first but finished strong, scoring all nine of his first-half points in the final 8:24. The senior forward, who entered the game averaging 17.4 points, was the last of UH's five starters to crack the scoreboard. Acting satisfied with a road split, UH returns home Saturday night for a nonconference game against Santa Clara of the West Coast Conference. "We're going to finish up strong," said Tatum, who had five assists to go with 11 points. "We've still got four or five games left to get a good streak together before the WAC tournament. "We're good. We're going to be fine." 3-point goals -- Hawaii 1-12 (Lojeski 1-5, Tatum 0-1, Gipson 0-3, Sensley 0-3), FSU 8-25 (Coleman 4-8, O'Neil 2-4, Morris 1-3, Hosley 1-4, Bell 0-2, Hernandez 0-4). Personal fouls -- Hawaii 16, FSU 16. Fouled out -- Gueye. Steals -- Hawaii 6 (Lojseki 3, Sensley 2, Gueye), FSU 9 (Bell 2, Coleman 2, Hosley 2, Cesar, Hernandez, O'Neil). Blocked shots -- Hawaii 5 (Gueye 5), FSU 3 (Hernandez 3). Turnovers -- Hawaii 14 (Sensley 4, Gueye 3, Tatum 3, Lojeski 2, Thompson 2), FSU 11 (Coleman 4, O'Neil 3, Bell 2, Hosley 2). Officials -- Verne Harris, Tom O'Neill, Bob Staffen. A -- 10,233.